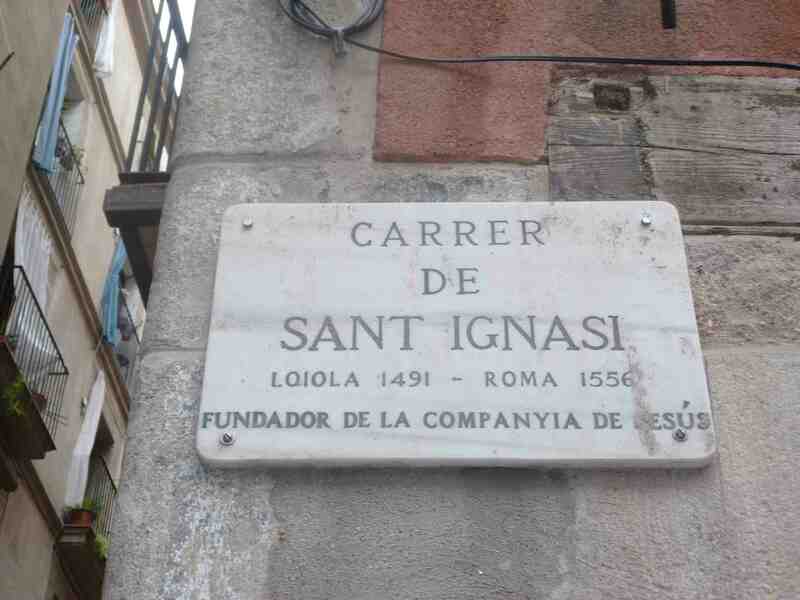 In the morning we met as a group at 8.30am to evaluate the Ignatian Camino. 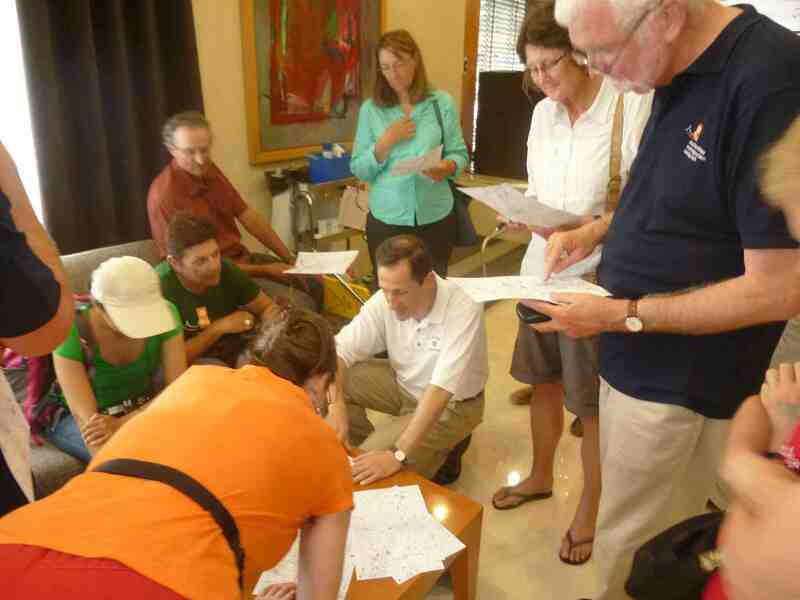 Vin Dillon was our facilitator and helped us with a good process. After breakfast we had a talk from Josep Sugranyes SJ. We spent the rest of the morning exploring the Centre of Ignatian Spirituality. Our credentials received the stamp for the final stage, and Helen picked up an “Ignaciano” for each of us, our official certificate of completion. We also purchased tee-shirts, calendars and other memorabilia. After spending the morning in Manresa, we took a bus to Barcelona. In the late afternoon Josep Lluís Iriberri SJ. 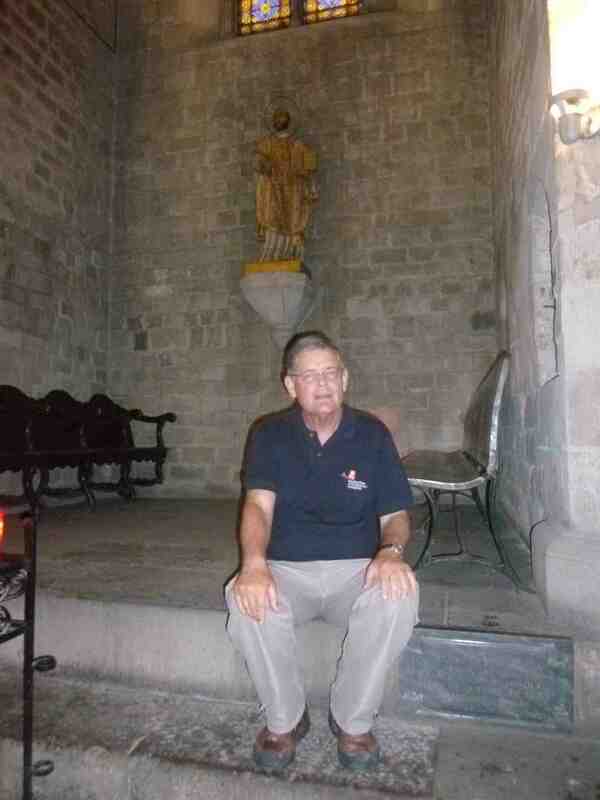 met us at the hotel in Barcelona and took us on a tour of the Ignatian sites in the city. 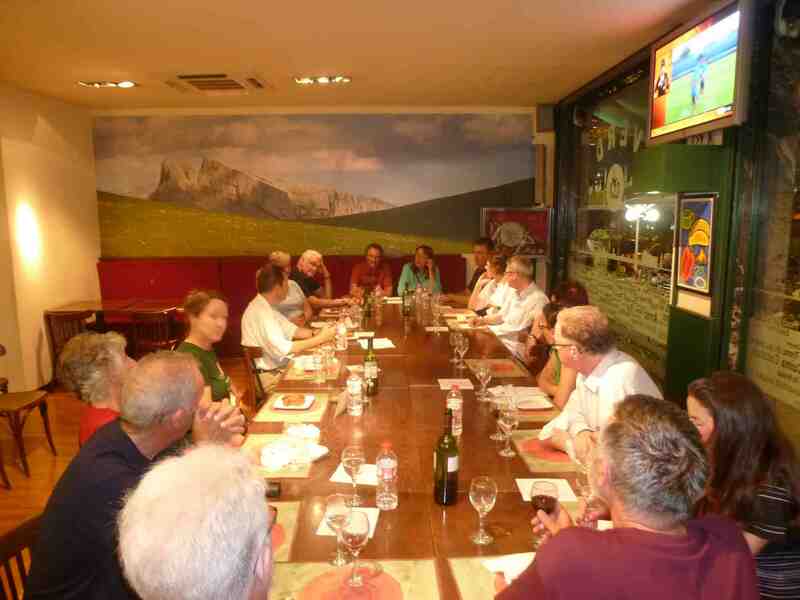 Then he joined us for dinner and a review of the Ignatian Camino. He continued on his way to Montserrat, pondering in his mind, as was his wont, on the great things he would do for the love of God. And as he had formerly read the stories of Amadeus of Gaul and other such writers, who told how the Christian knights of the past were accustomed to spend the entire night, preceding the day on which they were to receive knighthood, on guard before an altar of the Blessed Virgin, he was filled with these chivalric fancies, and resolved to prepare himself for a noble knighthood by passing a night in vigil before an altar of Our Lady at Montserrat. He would observe all the formalities of this ceremony, neither sitting nor lying down, but alternately standing and kneeling, and there he would lay aside his worldly dignities to assume the arms of Christ. 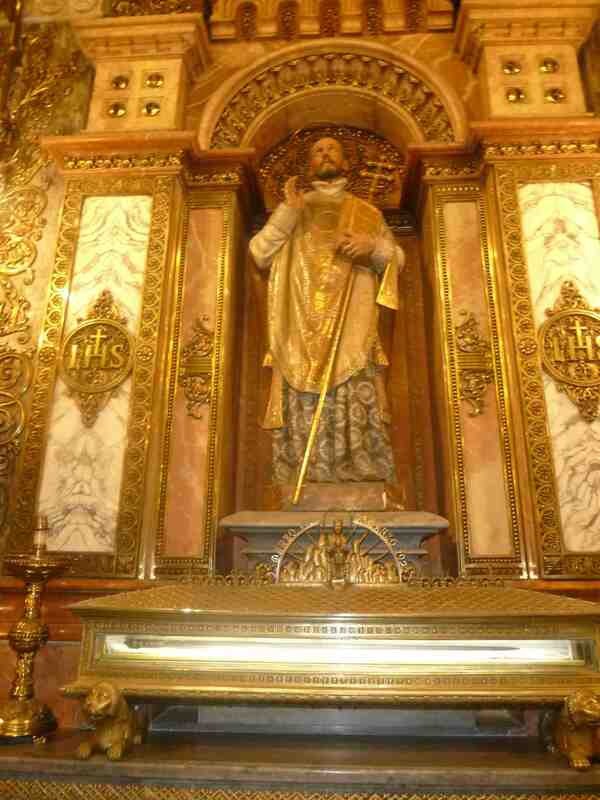 When he arrived at Montserrat, he passed a long time in prayer, and with the consent of his confessor he made in writing a general confession of his sins. Three whole days were employed in this undertaking. He begged and obtained leave of his confessor to give up his horse, and to hang up his sword and his dagger in the church, near the altar of the Blessed Virgin. This confessor was the first to whom he unfolded his interior, and disclosed his resolution of devoting himself to a spiritual life. Never before had he manifested his purpose to anybody. The eve of the Annunciation of Our Blessed Lady in the year 1522 was the time he chose to carry out the project he had formed. 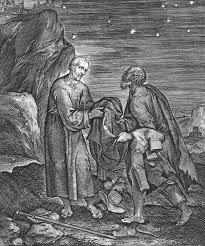 At nightfall, unobserved by any one, he approached a beggar, and taking off his own costly garments gave them to the beggar. 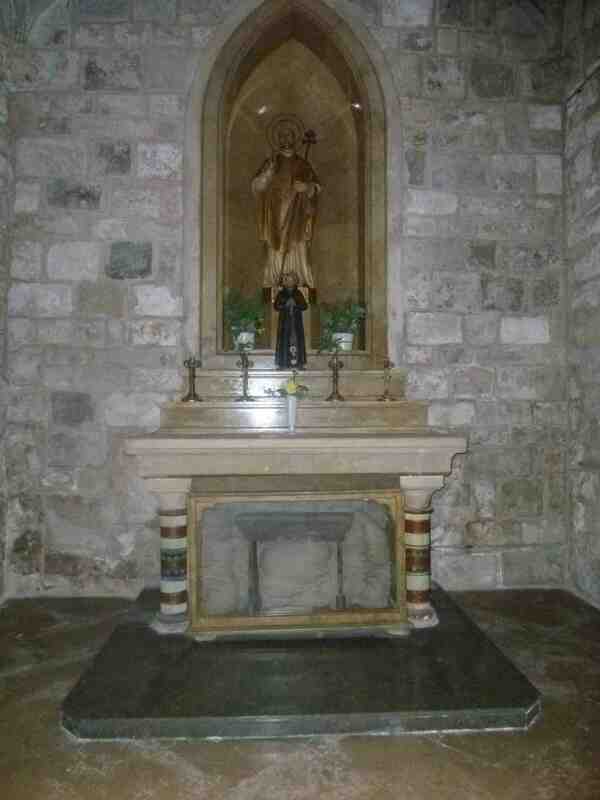 He then put on the pilgrim’s dress he had previously bought, and hastened to the church, where he threw himself on his knees before the altar of the Blessed Mother of God, and there, now kneeling, now standing, with staff in hand, he passed the entire night. Over dinner we shared our experiences with Josep Lluís and made recommendations about ways in which the Ignatian Camino could be improved. One of the things he told us was that we were the first organised group of pilgrims to walk the entire way from Loyola to Manresa. We are honoured to have achieved this. Thanks, Michael, for all your stories, photos, points for prayer and generous sharing during your Ignatian Camino adventure which are now concluding in historic Barcelona. Your Blog has been great for me! Buenos días, Miguel y Compañía. Un saludo, ya desde mi casa. Este ha sido para mí un día agridulce para mí. Dulce porque una vez más me habéis demostrado vuestro CARIÑO y AMISTAD. Agrio porque ha sido la despedida después de los días que he compartido con vosotros. Ha sido una experiencia muy gratificante para mi, porque después de andar tantos Caminos, en el de Santiago y el Ignaciano, he vivido una manera distinta de realizarlo. Solo puedo daros un consejo para cuando algo en nuestra vida vaya mal y os acordéis da la palabra que decíamos cada vez que reemprendíamos la marcha: ¡¡VAMOS!!. Espero que nuestra vida sea un BUEN CAMINO y que Dios y San Ignacio nos guíen y protejan como lo han hecho en esta experiencia. Como os dije cuando nos separamos en Alda, no quiero que esto sea una despedida sino un hasta luego, porque espero veros alguna vez. Si venís otra vez a este País sabéis donde tenéis un amigo y vuestra casa. Como decimos en euskera : Agur eta gero arte. (Adiós y hasta luego). Good morning, Michael and company. Best regards from my home. This has been for me a bittersweet day for me. Sweet because once again you have shown me your LOVE and FRIENDSHIP after the days I have shared with you. It has been a very rewarding experience for me because, after walking many roads to Santiago and the Ignatian Camino I have lived a different way to do it. I can only give you a tip for when something goes wrong in your life and gives voice — you will remember every time we said the word ¡¡VAMOS!! — GO!!. I hope that our life is a GOOD WAY and Saint Ignatius and God will guide and protect us as they have done in this experience. As I said when we parted in Alda, do not want this to be a goodbye but a see you later, because I hope to see you sometime. If you come back to this country know where you have a friend and a home. As we say in Basque: Agur eta gero art. (Bye and bye). Greetings from Barcelona Airport. We are just about to board the plane to Dubai and then on to Melbourne. Thank you for your friendship and help of the past month. We relied on you and were so grateful that you were with us. You too will have a home in Melbourne if you ever visit.